Monday, February 4 was a red-letter day for stewardship in California. 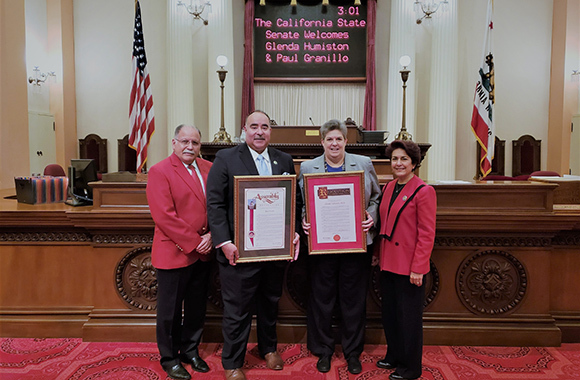 Not only was the California Legislature celebrating the Chinese Lunar New Year and “National Wear Red Day” as a symbol of support for women’s heart health, but members of both houses also paused to recognize Glenda Humiston and Paul Granillo as recipients of the California Economic Summit’s 2018 Steward Leader Awards. Senator Anna Caballero and Assemblymember Jose Medina joined together to issue joint resolutions to Humiston and Granillo commending their exemplary records of civic leadership, both have served on the California Economic Summit Steering Committee since its inception in 2011. California Forward, a bipartisan good government reform effort to improve performance and democracy, and the California Stewardship Network, an alliance promoting economic vitality, hosted the first California Economic Summit 2012. The California Steward Leader Awards are presented annually at the California Economic Summit to individuals who have contributed significantly to aligning public, private and civic sector leaders to advance the triple bottom line: promoting economic, social and environmental progress in all regions throughout the state. These individual best exemplify leaders who help sustain California as a place to create and thrive, to enjoy and to explore, to nurture and to bestow to future generations. Previous recipients of the California Steward Leader Award include former California State Senator Becky Morgan, California Emerging Technology Fund’s Sunne Wright McPeak and Van Ton-Quinlivan, vice chancellor of the California Community Colleges. The 2019 California Economic Summit takes place on November 7-8 in Fresno. The nominating window for 2019 Steward Leader Award recipients will open September 1 on CAEconomy.org.